Quick Quote stores your customer's information and history as it follows an easy path from estimate to work in progress and then a final invoice. Sales reports can be generated for any date range as well as mailing lists or labels. An Automated Service Reminder Letter System keeps your clients coming back. And, you can process credit cards from within the program! 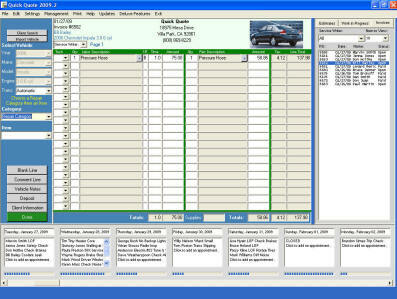 Quick Quote is the world's fastest estimating software for automotive mechanical repairs. The parts and labor database covers Foreign and Domestic Cars, Light Trucks and Motorhomes from 1980 up. Mileage services are shown in detail. Diagnostic charges for computer scans are also included. Quick Quote has been sold to Auto Repair Shops and Dealerships in all 50 States and a total of 5 Countries. The labor hours are based on Real Shop Time which was derived by a consensus of Shop Owners. The parts prices are based on an average of Aftermarket Suggested List by major parts manufacturers. Quick Quote was written by Don Holthe, an ASE Master Technician and Shop Owner with over 30 years in the auto repair industry. Quick Quote is unique in the industry in that you can make permanent changes to the estimating data base. You can change labor times and parts prices globally by percentage and on an individual basis. The menus and messages are also easily changed to fit the needs of repair shops and dealerships everywhere.